Nigeria's presidential election may have officially wrapped up, but the country is still awaiting the final results of Saturday's state elections which could have a significant impact on the country's future. Counting is still ongoing for 29 out of 36 states, as well as the Federal Capital Territory of Abuja, with full results expected in the coming days. In Lagos the ruling All Progressives Congress (APC) maintained control of the governorship according to early results announced by the Independent National Electoral Commission (INEC), while concerns were raised after the outcome in the states of Sokoto, Adamawa, Plateau and Bauchi were declared inconclusive. On Monday the European Union Election Observation Mission in Nigeria stated that the elections were "overshadowed by systemic failings" and demonstrated "the need for an inclusive national discussion on electoral reform." "The environment for this election has been difficult with cases of violence and intimidation," chief observer Maria Arena told reporters. The Situation Room -- an umbrella group comprising of more than 70 civil society organizations -- also called for a nationwide independent inquiry into the election. The state elections took place just two weeks after Nigerians headed to the polls to vote in a shambolic presidential election which ultimately led to the victory of APC's incumbent President Muhammadu Buhari. Although they have received considerably less attention in comparison, regional elections have a major influence on Nigerian politics, as governors control state finances and are responsible for key sectors such as health and education. As a result, the elections were closely watched by both national and international observers and security was ramped up across the country due to fears of election-related violence. 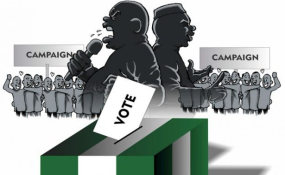 Although the overall turnout for the 2019 state elections was reportedly low, many Nigerians take these elections more seriously than the presidential elections, as the governor and state legislature representatives directly impact their lives. "The state elections are actually the most important elections for most people because this is where governance is really felt," the Director of the Center for Democracy and Development (CDD), Idayat Hassan told DW. "The most important things that shape the lives of the people in terms of education, water and health are often provided for as part of the function of the state houses of assembly and the state governor." A number of governors control a state budget even larger than those of neighboring countries thanks to their access to oil reserves in the Niger Delta region, meaning they have a considerable amount of power and influence over the country's economy. For example, at $136 billion (€121 billion), the 2017 GDP of Nigeria's richest and most cosmopolitan state, Lagos, was higher than that of Kenya at $74.9 billion. Governors also have significant influence over sweeping state laws. In 1999 then-Zamfara State governor Ahmad Sani Yerima notably pushed for the introduction of Sharia law in the country's north, which is still in practice today. Violence has overshadowed the polls in some of the country's more volatile regions, with election authorities announcing the suspension of all electoral activities following a spate of attacks and threats to polling staff in the opposition-held Rivers State. "The safety of our staff appears to be in jeopardy all over the state and the commission is concerned about the credibility of the process," said the Independent National Electoral Commission (INEC) in a statement. The British High Commission in Abuja had earlier tweeted its concern over "reports of military interference in the election process in Rivers State" after men in military uniforms were accused of blocking roads around the electoral building where officials were counting votes. The Nigerian army promised citizens in the lead-up to the elections that they would deploy all available resources so that they would be free to vote in a non-violent environment. However women's rights activist and People's Democratic Party (PDP) supporter, Anniko Briggs, believes the militarization of the election has a more sinister purpose. "You cannot saturate and overrun the Niger Delta region under the pretext that there will be electoral violence so that you can rig the election," she told DW. However, the media director of the ruling APC, Chris Fine, says the deployment of the military was necessary to ensure credible elections. "The elections in River State should be heavily militarized so that people can come out freely without fear of favor and cast their vote," he told DW. There have been numerous other reports of unrest and deaths in addition to the conflict in Rivers State. Police told reporters that a local election observer was killed on Saturday in the southeastern state of Enugu after he was "hit by a stray bullet fired by a policeman to disperse a group of protesters." Meanwhile, in Katsina State in the country's northwest, at least 10 people from the INEC were also kidnapped on Saturday after approximately 50 gunmen stormed polling stations. Tension, insecurity and corruption in many Nigerian states -- particularly around election time -- is nothing new. "Electoral corruption is actually much more prominent in the state elections, because we are talking about very localized elections," explains Hassan. "Because of the diverse issues at play, it means that people will do anything and everything to get into office." The INEC's announcement that it would suspend the collation of votes in Rivers State evoked many reactions, with police dispersing a protest by supporters of the ANC on Monday morning who were unhappy with the decision. But Hassan doubts that fresh elections will be held. "Calling a new election would prove so difficult," she told DW. "It's a problematic state and it's a state that if decisions are not taken and people are not even held accountable for infractions, then it will only get worse in subsequent elections.